Ok, so you really don't need a recipe for this. It's one of those meals that came from leftovers. 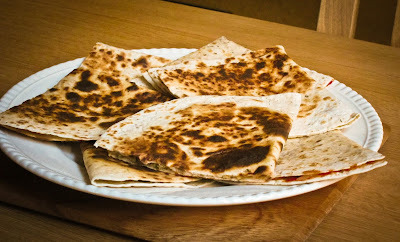 I made pizza last week and since I had some pizza sauce, olives and cheese left, I decided to make some pizza quesadillas. My pizza sauce contains passata, oregano, garlic powder, onion powder, salt and pepper and of course this is all to taste. But you can use any pizza sauce you prefer. - In a large skillet on a medium high heat place a flour tortilla, spoon as much or as little pizza sauce on one half of the tortilla and sprinkle some cheese and olives. - When the cheese starts to melt, flip the half without any sauce on top, grill on both sides until the tortilla is golden brown and crispy and enjoy!